We accept orders from customers worldwide. You can purchase our software products online (24/7), via our e-commerce software sales partner Share-it, a Digital River subsidiary. The purchasing process is quick, easy and secure (SSL encrypted). Share-it processes transactions in all basic currencies (USD, CAD, GBP, EUR, etc.) and supports various forms of payment (all major types of credit cards, PayPal, bank/wire transfer, giropay, etc.). Immediately after receipt of payment by Digital River (Share-it) you will receive an email including download link and invoice for the software product purchased. For more information, read Share-it’s FAQ about purchasing at Share-it. Excel-Financial-Model is compatible with Excel 2007 (v12.0) and later for PCs or Excel 2011 (v14.0) and later for Macs. It works in all international Excel versions. This means that you can use EFM in the English version of Excel but also in international versions such as German, French, Spanish etc. EFM is not compatible with Excel Online (formerly Excel Web App) as this browser-based version (part of Office 365) does not support VBA. However, it is compatible with Excel 365 desktop version. 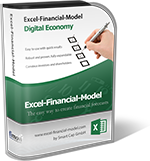 EFM does not work in any other spreadsheet program such as e.g. Google Sheets, Numbers for Mac, or Open Office. In accordance with the laws governing members of the European Union (EU), we are obliged to charge VAT on all orders placed by customers in member countries of the EU. Amounts of VAT charged are in accordance with the local legislation in each country and will be automatically calculated within the purchase process. EU customers with a valid VAT registration number are exempt from VAT. They must use the Reverse Charge Mechanism to account for the EU VAT on those transactions. Smart Cap GmbH and its ecommerce service providers reserve the right to charge VAT where insufficient or unclear evidence of VAT registration is supplied at the time of purchase. All VAT numbers will be verified.